The Spirit of the Lord spoke through me; his word was on my tongue. The God of Israel spoke, the Rock of Israel said to me: ‘When one rules over people in righteousness, when he rules in the fear of God, he is like the light of morning at sunrise on a cloudless morning, like the brightness after rain that brings grass from the earth.’ "
The final words of David are, like so many other people’s final words, the thing the speaker believes to be the most important. These may not be David’s dying words spoken with his last breath, but they are his final statement of what he believes to be true and his final assessment of his life. The use of the phrase “inspired utterance of David” indicate that David was speaking prophetically as he uttered this oracle of inspired speech from God. Son of Jesse – the son of promise in a line of sons that connect the promised Seed of the woman to Abraham to Judah to Jesses through David to Solomon to Zerubbabel to Jesus. Godly leadership lays the foundation and creates the environment necessary for the community to flourish in knowledge, understanding, growth and production. This is what David would want us to remember from his life. Shapat (Hb) – Judge (Eng) – shapat is the Hebrew word that means “to judge,” “to deliver,” “to rule.” In the judicial sense shapat refers to the person who decides between two opinions or between two people who are at odds with each other. In an active sense shapat refers to the person who would deliver a person or a nation from oppression or injustice that had resulted because of the lack of fair judging or leadership. Does my attitude, my actions, my leadership and my service provide an environment that is conducive for people around me to be: - Enlightened? - Refreshed? - Productive? 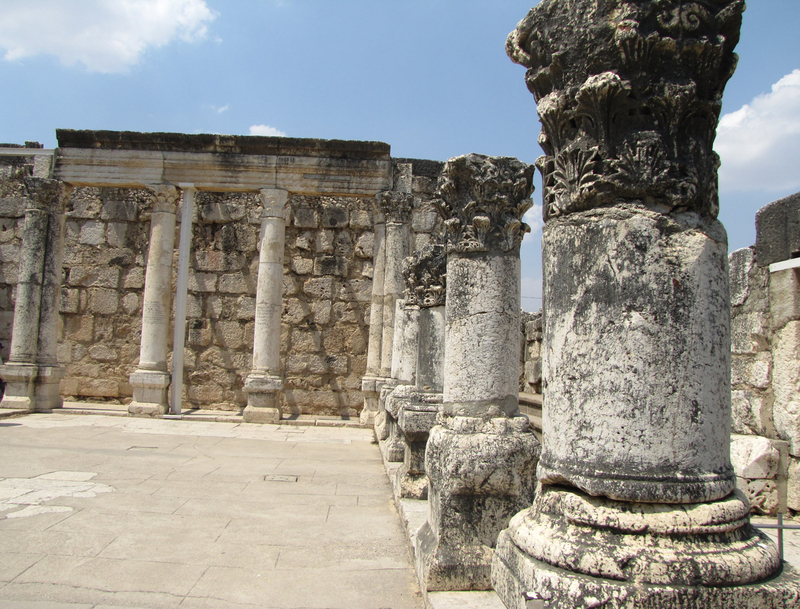 Inside the synagogue in Capernaum whose foundation dates back to the day that Jesus preached here in Mark 1:21. 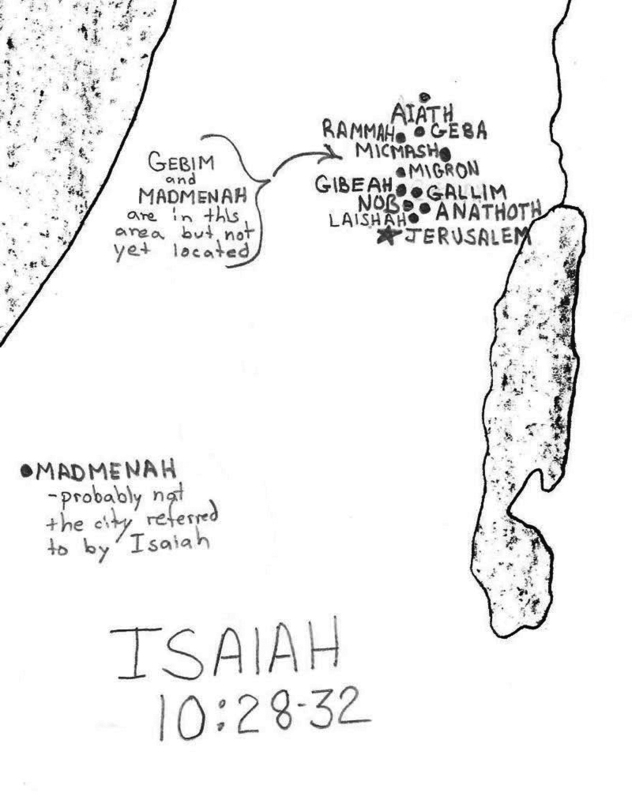 Details of Isaiah 10:28-32 located on a map. Concerning the nature of the Trinity, Jesus may have said it best when he said, “I and the Father are one” (John 10:30). The use of “I and the Father” shows the two separate persons of the Son and the Father. The statement that they “are one” uses the plural verb for the two persons, but the neuter form of “one” avoids referring to “one person” by not using the masculine. Instead, the use of the neuter form of “one” refers to the nature or the essence and means the two persons are one nature and have the same attributes. The gate Solomon built on the Ophel and which is referred to by Nehemiah as the Water Gate (Nehemiah 3:26) has been located. This gate led to the residences to some cisterns (not to the Gihon Springs). It has been located south of the Temple Mount just north of the City of David. This gate has the three typical components of a gate built at this time as does a contemporary gate at Megiddo: an inner gate house, an approach tower (bastion) and an outer gate house. "Stay away from a fool, for you will not find knowledge on their lips." One way to avoid saying something you will regret is to avoid speaking. They go over the pass, and say, “We will camp overnight at Geba.” Ramah trembles; Gibeah of Saul flees. This day they will halt at Nob; they will shake their fist at the mount of Daughter Zion, at the hill of Jerusalem.